a production adapted by Ian Finley from the plays of Sophocles (Oedipus, Oedipus at Colonus and Antigone). The three one-hour plays are designed to be seen together over the course of a single evening (tickets $25), but can also be viewed separately on different dates if desired (tickets to each $10). Student Rush tickets at curtain time, if available, are $5 for the three play viewing. There is no performance on Sunday, June 11th. 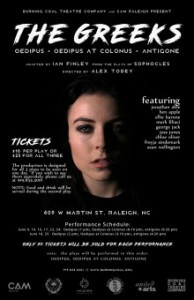 For tickets, please call Burning Coal Theatre at 919.834.4001. Each play is approximately one hour long with a 10 minute intermission to follow. Please visit www.burningcoal.org for information about ASL and audio described performances.NOTE: Food will be served during the second play.